The Training Band is open to anyone 6 years or older who wants to learn to play a brass instrument. We welcome both children and adults of any age (it’s never too late!) - from absolute beginners to people who have enjoyed playing music in the past and would love to get back into it but are unsure how to take the first step. Playing music is such a social activity, and there are lots of laughs to be had with us on a Wednesday evening, so why not take a chance and give it a go? Membership is just £2.50 per week, which even covers the loan of an instrument, making this a really inexpensive way to get into music making! 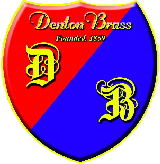 For more information please feel free to email us at dentonbrass@hotmail.com, or call and speak to Gordon Griffiths on 07941 317484. The band has a Child protection policy and Senior tutors have Disclosure and Barring Service (DBS) checks (previously CRB checks).